Boy of Summer: Free Phil Hughes! I detailed a few weeks ago, when Chien Ming Wang went back on the DL, how I thought that Joe Girardi had dropped the ball with regard to managing his bullpen. I explained how I thought Girardi could have used Phil Hughes more liberally, for longer outings, to keep him closer to being ready for a job as a starting pitcher, should the need arise. At the time, Alfredo Aceves was being called upon as a spot starter, though without any intention of him being the long-term solution. Aceves gave up four runs (three earned) in 3.1 innings and promptly returned to the bullpen. The Yankees won that game, as they seemingly always do against Minnesota, so nobody got too bent out of shape about the poor start. The next time the Yankees needed a #5 starter, they called upon AAA re-tread Sergio Mitre, who's 28 years old and whose last good season was, well, never. He spent four years bouncing up and down from AAA to the majors with the Cubs and later the Marlins from 2003-2006, never pitching more than 60 innings and never posting an ERA below 5.37. His best year came in 2007 when he pitched 149 innings with a 4.65 ERA and went 5-8. Hardly awe inspiring. He then missed all of 2008 following Tommy John surgery and has pitched well in the minors this year, but is nobody's idea of a long-term rotation solution for a team trying to win a World Series. Well, maybe his own, but nobody else's. True to form, Mitre pitched 5.2 innings and gave up four runs (three earned), but he got the win, which of course is the point. It's possible that he's going to improve as he gets more experience, that he might even be a better pitcher than he was before the surgery, not that this is saying much, but of course it's more likely that he'll continue to pitch 5 innings and give up four runs more often than not, which is not acceptable. In the meantime, Girardi still hasn't figured out that the solution to his problem is right there, under his nose, in the Yankee bullpen: Phil Hughes. Following Wang's return to the DL on July 6th, Hughes was used for just 12 pitches on the 8th, 19 pitches on the 9th, and then 26 pitches on the 12th, just before the All-Star break. After the break, Hughes pitched two innings on July 17th, throwing 40 pitches in relief of A.J. Burnett against the Tigers, and got the Win. At this point Hughes seemed to be on track to become a starter again. He had increased his pitch count in each of his last four outings, and was now up to a little less than half of what would be expected of him as a starter. But then Girardi inexplicably pulled back the reins. 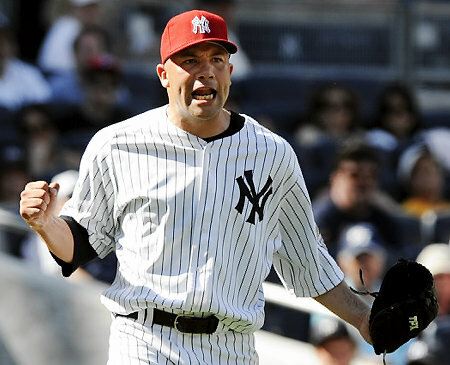 Two days later, he brought Hughes into the 8th inning of a 2-1 game against Detroit and allowed him to retire the side before bringing in Mariano Rivera for the Save, even though Mo had pitched two days in a row already. That's OK for Rivera, who's certainly capable of that, but there's no reason that Mo has to get the Save, is there? Other than tradition? Hughes has been as good as Mariano Rivera or any other reliever in baseball for the past two months, having allowed only two runs in 22 innings of work, including 28 strikeouts and five walks. He was perfectly capable of Saving that game for Joba Chamberlain. Still, I can understand Girardi's thought process here a little, as Joba has only one Win at home this year, and he wanted to make sure he did everything by the book, lest the lead be blown and Joba take yet another hit in the press (and another shot to his ego) for not getting the job done at New Yankee Stadium. On the 21st, when Mitre started and went less than 6 innings, Hughes would have been the logical choice to relieve, had he not just pitched an inning two days earlier. With three days' rest in between his 40-pitch outing and this one, he might have been able to throw the last three innings and work his pitch count up to 50 or 60. Instead, since Hughes had tossed an inning on the 19th, Girardi brought in Aceves, Coke and Mariano Rivera, who did their jobs admirably, I must admit. But the usage of Hughes last night was truly inexplicable and inexcusable. With the Yankees riding a five-game winning streak and staked to a four-run lead against the lowly Baltimore Orioles, Hughes came in to relieve Burnett yet again. A.J. had allowed only two runs in seven innings, but was over the 100-pitch mark and not likely to finish the game, so Hughes was the logical choice. He made quick work of the Birds in the 8th, allowing only a single to Gregg Zaun (whose homepage is incongruously awesome, by the way) but promptly erasing said awesome backup catcher on a double play. Nifty work - 16 pitches - piece of cake, right? Four run lead, non-Save situation, so you leave him in, right? Wrong. Apparently, if you're Joe Girardi, you send Hughes to the showers and you bring in Brian "Feast or Famine" Bruney, who entered the game with a 4.86 ERA for the season and who had allowed six earned runs in his last seven outings. Bruney struck out the first two batters he faced, then allowed homers to the next two, suddenly making the four-run lead a two run lead, and making the game a Save situation, which necessitated bringing in Mariano Rivera to get the final out, which he did. This, it seemed to me, was an obvious chance to continue grooming Hughes for a life as a starter. he could have pitched an extra inning, and even if he got into a little trouble, there was some wiggle room with a four run lead and the best closer on the planet in the bullpen. 3) Use expensive and talented closer to finish game. The trouble of course comes not with the in-game issues, as any eight year old could follow the above instructions to manage this team. the problem is that part of a manager's job is to keep winning all season, to keep his players playing well, and to manage their strengths and weaknesses. Keeping Phil Hughes locked up in the Yankee bullpen, using him only for an inning at a time when he so clearly is capable of much more than that, suggests that Girardi can't do that second thing, and it will cost the Yankees in the long run.